Coventry City midfielder James Maddison is keenly awaiting Steven Pressley's return to the Ricoh Arena on Saturday as he 'owes his old boss a lot'. Pressley, now manager of Saturday's opponents Fleetwood, gave Maddison, 19, his Sky Blues debut in 2014. His subsequent development earned a seven-figure fee in January when they sold the Academy product to Norwich, since when he has been loaned back. "He was the first manager I had. He trusted me," Maddison told BBC Sport. "I owe Steven Pressley a lot. I've a lot of respect for him and (his assistant) Neil McFarlane. He threw me in there because he knew I'd be able to cope. "I'm not going to hold back at the weekend. Of course I want to smash Fleetwood but, in my development, he was massive." Maddison's debut for City came in a League Cup home defeat by Cardiff City in August 2014. He then enjoyed two Football League Trophy wins under Pressley and two league appearances from the bench before his first League One start in October, when he scored on his full debut in a 4-1 defeat at Oldham. In their first game since the 6-0 home win over Bury on 13 February, City's best league victory since 1963, Sky Blues boss Tony Mowbray is already mindful of the threat presented by a Fleetwood side one place above the relegation zone. 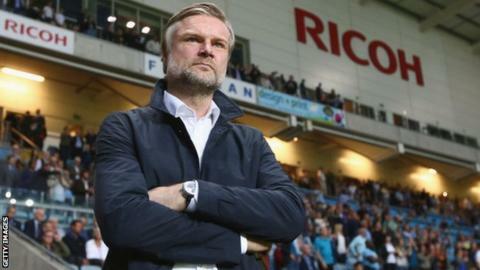 The Cod Army, who have not beaten Coventry in three previous meetings, are managed by Pressley, who is making his first return to the Ricoh Arena since being sacked in February 2015. "I fully understand the previous manager coming back to his old club," Mowbray told BBC Coventry & Warwickshire. "He's put together a nice team. He'll have them fired up. "Whether there's extra spice in it for him, I'm not sure. It's a game that he would like to win and get a positive performance. We'll be mindful of that, but we're mindful against every opposing team who come here that we have to be at our best." Pressley's first game as Fleetwood Town manager was against Coventry in October, and was spoiled when a last-minute own goal by former Sky Blues defender Richard Wood handed the visitors the three points. Pressley told BBC Radio Lancashire he still has some warm thoughts for his former club, admitting: "I loved my time there. I had a really good rapport with the supporters and I've got some fond memories. "I was disappointed with the way it ended, but I understand football and the way it can be driven by results and I did a lot of work that can sometimes go overlooked. "I reduced the budget by 60% in two years, which is almost unheard of, and had to develop young players and play a very young team. "To be honest, if we had not done some of the things we did, like the sale of Callum Wilson, there might not be a Coventry City." Steven Pressley was talking to BBC Radio Lancashire's Phil Cunliffe.